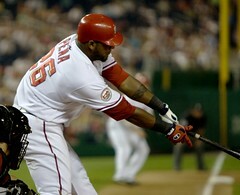 Boston Red Sox | Let Teddy Win! 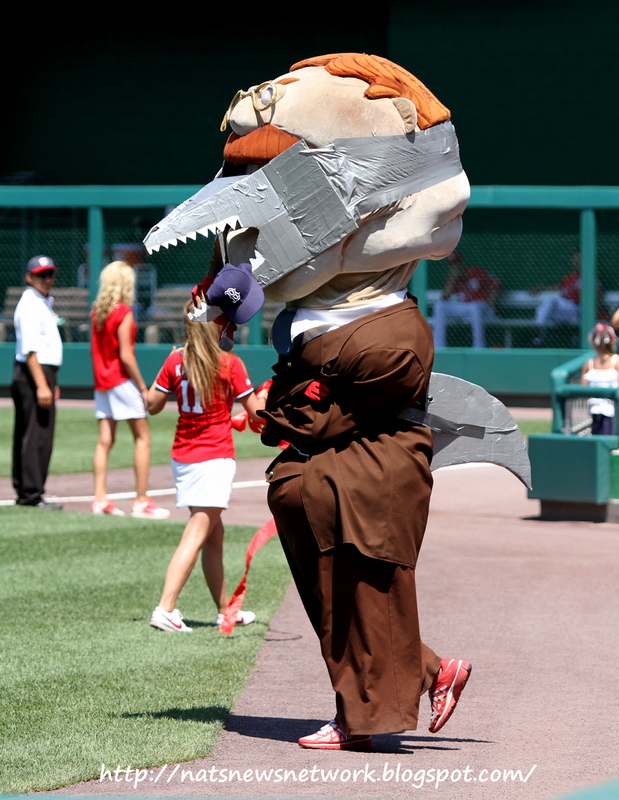 Shame on me for missing this one, but Sunday’s Shark attack by Teddy Roosevelt was more than just a celebration of Shark Week. 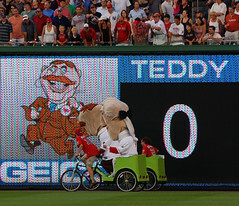 As Dan Steinberg pointed out in the outstanding DC Sports Bog, there was a Boston Red Sox cap stuck in Teddy’s teeth. Funny. When I visited last summer, Fenway felt like a giant after-work happy hour, they played a watered-down version of baseball with a DH, tossed beach balls in the stands, and fans poured out early because the team was losing. The racing presidents pulled out all the stops for the standing room only crowd of 41,985 tonight at Nationals Park, completing the homestand against the Boston Red Sox with a multi-vehicle presidents race relay. Abe Lincoln and George Washington competed in the first leg, riding Segway personal transporters along the left field warning track toward a finish line that had been moved to center field from its usual location in foul territory. With Abe on a Segway and unable to put on his usual burst of speed, George was able to hand a huge lead to Thomas Jefferson, who took on Teddy Roosevelt in the second leg riding pedicab bicycle taxis. Tom jumped into one of the taxis as the driver started peddling him to the finish line, but then Teddy Roosevelt took the reigns and started peddling his own cab. The Rough Rider ignited the crowd when he briefly overtook Tom, but the peddling wore him out. Teddy faded at the finish and failed to deliver for the 201st time. Perhaps Teddy knew better than to take the field with the Boston Red Sox. The Nats set another attendance record Wednesday night as the visiting Red Sox helped draw a record crowd to Nationals Park for the second night in a row. Boston took the lead for good in the 4th inning, just before George Washington, Thomas Jefferson, and Abe Lincoln took the field for a very unusual presidents race. The other presidents stopped in their tracks to watch Teddy’s antics, but after about ten seconds, Abe Lincoln took off towards the finish line, leaving George and Tom staring at the screen. Never a one to win graciously, the Great Emancipator celebrated his uncontested victory by dancing as two members of the Nat Pack sprayed fire extinguishers at his feet. The largest crowd in Nationals Park history was on hand Tuesday night for the opener of the Washington Nationals first home series against the Boston Red Sox. The variety of Red Sox paraphernalia on display suggested that many were going to see their first Washington Nationals presidents race, and Teddy Roosevelt — always the showman — set out to make an impression. 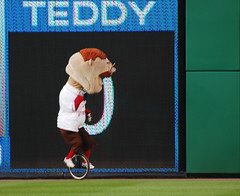 When the 4th inning race began, Teddy dashed out and hopped aboard a unicycle. 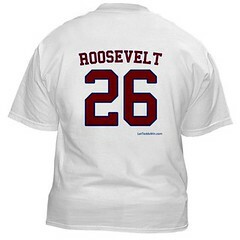 Whether our #26 thought this would help him win the race is hard to say, but he gave it a valiant effort before falling quickly behind the other racing presidents. Teddy gave up on the unicycle about half-way through the race, but it was far too late to catch up to Abe Lincoln, who has now won four of the last 5 races to take a commanding lead in the season standings.